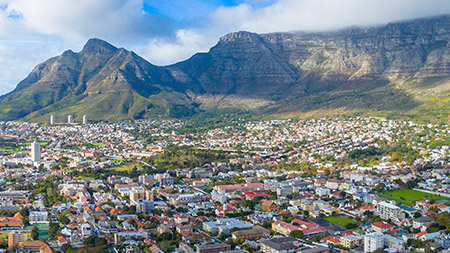 Convenience, an abundance of amenities and the buzz of living in a major city are all drawcards for those living in central Cape Town. Ceramicist Clementina van der Walt talks about living in the CBD. Well-known studio potter Clementina van der Walt draws her inspiration from the patterns, colours and textures in urban and rural African landscapes. She has lived in the CBD with her partner, Albie Bailey, for about 10 years and they love the convenience of being in the city centre. “We were looking for something with an urban inner-city feel but still private enough not to be overwhelmed by the street action,” says Clementina. When asked about how they deal with the noise of Long Street and its clubs, Clementina says, “Initially we used earplugs, but now it’s like a background hum. We hardly notice it. Inner-city living is noisy; one gets used to it.” And there’s plenty of variety to the soundtrack of urban life. The views of Table Mountain, Lion’s Head, Signal Hill and the harbour are all part of what inspires her about living at the heart of Cape Town’s vibrant centre. “We love the convenience of being in the city centre, the proximity to so many amenities, and the general urban buzz.” -Clementina van der Walt, resident. Ceramicist Clementina van der Walt has, over the last 40 years, lectured, run a production studio and held many one-person shows, with her work represented in national and international collections. She and her partner, Albie Bailey, run Clementina Ceramics Studio and a store in Woodstock and have a small studio and gallery outside Calitzdorp in the Klein Karoo. Watch movies at the Labia Theatre. Take a leisurely stroll in The Company’s Garden. Visit Long Street Baths for swimming and Turkish steam baths. Enjoy smooth jazz at The Crypt at St George's Cathedral. Watch a show at The Fugard Theatre. Attend literary events and browse for interesting reads at The Book Lounge. This article originally appeared in Neighbourhood, Sunday Times. With options to suit their lifestyle, level of activity, taste and budget, the peaceful Lowveld has much to offer retirees as a retirement destination. The tree-lined suburb of River Club offers a peaceful counterpoint to the activity in nearby Sandton and Bryanston.